Saving the best for last, Abyssal Owl. Being called from the hand lets you check the top 7 cards of the deck for a Luard card, then if you add one to your hand by this effect, you must discard cards whose Grade equals 3. 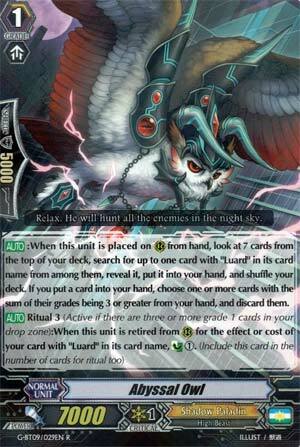 And his Ritual is to Countercharge 1 when a Luard Vanguard retires it for a skill. Well the first skill is fair enough. Grabs a Luard if you're lucky. Unfortunately if you open with only one Grade 3 then yeah you get him, but then you have to pitch the Stride fodder to not minus yourself so you need to hope you open good. The countercharging is where it's at really. Gets back the cost of a Spectral Blaster Diablo in a pinch or just allows a rear-guard to do something. As long as Luard's the main or backup Grade 3, run this. Is good stuff. Since Claret Sword got the standard "ditch a Grade 3 and search" kind of stride fodder/search fodder, they're doing a different style of searching for Luard. Instead of needing a Grade 3, you just ditch cards equaling Grade 3 if you find Luard. If. The chances of him being one of the top seven cards is likely, but not guaranteed. Ditching cards for Abyssal Owl's search does load up your drop zone for Ritual requirements, but I wouldn't ditch 2 or 3 cards just to search that early in the game. That's a lot of aggro potential wasted. Better off using Abyssal Owl when you have the Grade 3 to discard for cost. Of course, Abyssal Owl could lose his top effect entirely and be useful since he's part of your countercharge engine for Luard.dek. So, you're running 3 to 4 of this Owl regardless.